What is Java Server Faces (JSF) Tutorial? Java Server Faces (JSF) is a Java-based web application framework developed to make easy of development integration of web-based user interfaces. This tutorial describes about the basic JSF concepts to become expertise in the concepts related to JSF framework. 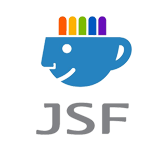 This tutorial is targeted for the beginners to know more about basic JSF programming. You will become expertise after completing this tutorial of JSF programming to go to the next levels. To learn this tutorial you must be aware of Java programming language, text editor, and execution of programs etc. It would be an added advantage if you are aware of other web technologies such as HTML, CSS, AJAX, etc.